File photo of Taoiseach Leo Varadkar. 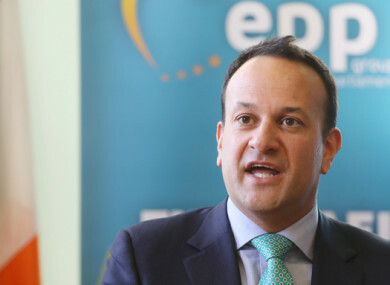 THE TAOISEACH LEO Varadkar has said that he supports school students going on strike next week as part of a global action on climate change. Friday, 15 March has been named as an international day of action on climate change, with students across the world staging a demonstration. The issue was raised in the Dáil yesterday by Solidarity TD Paul Murphy, who spoke about climate change and the planned demonstration and asked the Taoiseach if he supported the students’ action. “I note that 15 March has been named as the date for a global school student strike action. School students in Ireland will, hopefully, join that in large numbers,” Murphy said. “The contrast of those young people with the inaction of the world’s leaders could not be starker. The contrast is stark not only with climate change deniers like Trump, but with those like the Taoiseach who acknowledge that climate change exists and the role of human society in it but who do not want to do anything about it. Varadkar said that he would listen to the concerns of students. “The fact that young people are taking action, protesting and are going to strike and take a break from school on 15 March is good,” he said. “It is welcome. Unlike the deputy, I do not see it as a party political matter. It is quite different, and I have heard what they have said. These are young people standing up to adults. “They are children, pupils and students telling all the adults in all parties to get our act together and to do more about climate change because it is their future that is in jeopardy. That is why I support what they are doing and why we all must listen to what they are saying. Varadkar said that people in socialist parties like Paul Murphy’s should also listen as they are “climate tax deniers” who “deny the fact that a carbon tax or climate charge must be part of the solution to climate change”. “We know that a carbon charge alone will not solve climate change but we equally know, and the science tells us, that without it we cannot achieve our objectives. It must be part of the solution,” Varadkar said. Murphy and his party colleague Ruth Coppinger called for the government to work towards cutting the country’s carbon emissions. Murphy said that students next week should take Varadkar’s comments “as a green light to walk out next Friday week in protest against climate inaction”. Following the taoiseach’s comments, a government spokesperson said he was commenting on the students’ “enthusiasm”. Email “Leo says he supports school students going on strike next week as part of global action on climate change ”. Feedback on “Leo says he supports school students going on strike next week as part of global action on climate change ”.